The revolutionary SharkTooth Traditional Crossover Pick comes in a dual (two unit) package from Strum-N-Comfort Picking Systems. The Crossover Pick is the "World's Most Comfortable" Thumb Pick ever devised. 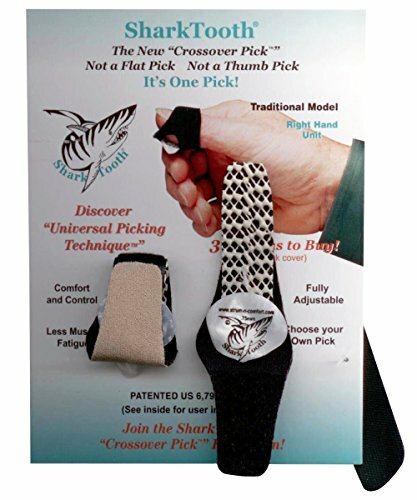 The highly functional SharkTooth Traditional Crossover Pick uses a thin, soft brown Neoprene strap and a hook Velcro pick/strap assembly in combination. The adjustable Crossover Pick attaches to the players thumb and fits any thumb size -even small thumbs. Both straps can be trimmed for a clean fit for any thumb size. Each dual pack comes with two brown Neoprene straps and two different gage celluloid flat picks. The two flat pick gages are; medium (0.75mm) and heavy (1.0mm). There is an extra "hook Velcro" strap included so that you can use your favorite flat pick with the system. No gluing is required to use your own flat pick with the Traditional model Crossover Pick system. The package also includes an instruction card to support ease of use. Strum-N-Comfort Picking Systems is dedicated to helping stringed instrument musicians of all types to achieve a "Universal Picking Technique" as applied to their specific instrument. Master players around the world are using the Crossover Pick for new music compositions and in teaching. Applications for guitar, bass, Dobro, banjo, autoharp, mandolin and other stringed instruments are developing world wide. If you have any questions about this product by Strum-N-Comfort, contact us by completing and submitting the form below. If you are looking for a specif part number, please include it with your message.